What Effects Would Amazon Moving to Boston Have on Homeowners? 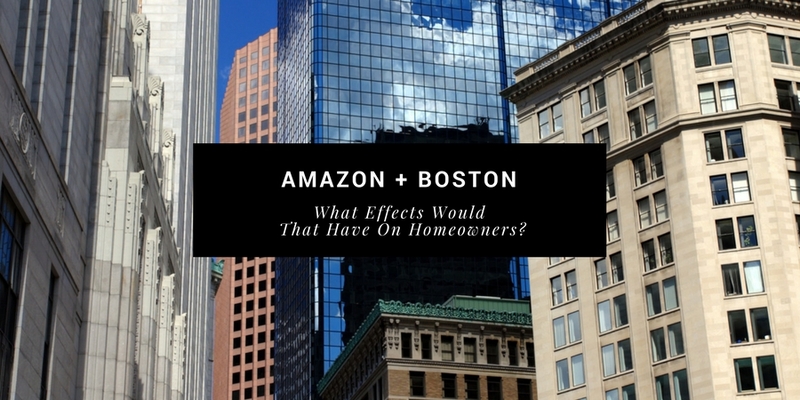 What Effects Would Amazon in Boston Have on Homeowners? Will Boston be Amazon's New Home? What Would The Effects Be On The Real Estate Market? Amazon is the world's largest online retailer with the main corporate office in Seattle, WA. The company has announced that they have outgrown their Seattle office and have plans and money invested in expanding their offices in many American cities but despite the expansion, they are looking for a second headquarters on the east coast. Many cities have been rumored to be in the mix including Chicago and Atlanta, but based on the company's recent real estate inquiry in Boston, MA might be evidence that they are looking to put their new headquarters in Bean Town. The piece of Boston real estate in question is a 500,000 square foot office building in the newly developed Seaport Square area. It is said that there is also an option for a second, equally sized office building in the same area. Their expansion plan also included details on a planned expansion of up to 8 million square feet within the next 15 years. What does this mean for the city and the state of Massachusetts? Having a multi-billion dollar corporation make their second home in a city can be incredibly beneficial. With a new business in town the size of Amazon, thousands of new high-paying jobs are created. An investment by a city this large can certainly add to the economy. Having large corporations base themselves in large cities can lure other big businesses to the city, exponentially increasing the job market. With new business comes new employees that have moved into the city to continue their jobs. This aids the local housing market as more and more houses get purchased, creating new Boston home owners. This can create additional demand for Boston homes for sale as well as demand for homes in the peripheral areas around Boston such as Cohasset, Quincy MA and Hingham. The cities surrounding Boston see a boost to their real estate market because as prices in Boston proper rise, many choose to move to the sub-burbs. Local businesses will see an influx of new potential customers prompting business owners to invest in the expansion of their own businesses. In addition to the effects to the real estate industry, the influx of high paying jobs increases the tax base with more good jobs. Those new Bostonian's will, of course, purchase most everything needed for their family within the Greater Boston area. That creates more local tax revenue and helps the local job market. Boston home owners might consider a corporation moving to town as a double-edged sword. City and state governments often lure large businesses to their city or state by using healthy tax break packages that includes large property tax deductions. This can cause home owners' property taxes to rise to make up the deficit. That is not always the case, as in many instances the newly incurred tax base from new employees can weigh that out. What makes matters worse is that most cities or states do not divulge the terms of the tax break packages to the public until well after the business has been relocated. For example, GE chose Boston to be the location of its global headquarters back in 2016 after choosing to move from Connecticut. The move brought in 800 jobs, but cost the city and state $145 million dollars from their relocation offer. This included $20 million in property tax relief and $120 million in grants, improvements to infrastructure, and real estate acquisition aid. This was the largest amount Massachusetts has ever paid to bring a large corporation to the state. Another tax issue is the amount of corporate tax breaks that are offered to large corporations as part of the enticing relocation packages. Giving corporations large tax incentives hurts the city's or state's bottom line, as some corporations can have so many tax breaks, they are actually owed money from the city or state. However, it is common that large corporations around the country have taken advantage of the system everywhere, making sure they never have to pay taxes at all. The environmental impact can also be felt when a new business comes to town. More physical waste must be dealt with, more water must be used and consumed, and air pollution from new motorists as well as the new building will increase. More traffic on the streets may be cause for new road construction. Road construction needed by the influx of a new business coming in and developing real estate generally incurs "impact fees" to help pay for the infrastructure needs. Many of these items are addressed when a city makes a proposal to a large corporation for moving their headquarters. Noise pollution could also increase, and with the adjacency of the proposed offices to luxury Back Bay Brownstones, citizens might not be too keen on moving in. When new businesses make a city their new home, a lot of small changes occur that can become frustrating for citizens. More new people in town means more vehicle traffic on the roads and more people using public transportation. This can lead to new road construction to handle the overflow of traffic, which can lead to longer commute times. Cities might take advantage of the new public transportation traffic and raise fare rates to make more money. Whether or not Amazon is moving to Boston is still up in the air. As many as 15 other cities are still in the running for the new headquarters. If the move occurs, Bostonians will have to endure their city's latest growing pains and roll with the changes. Of course, this could also lead to more large corporations being lured to the city, and the process begins once again. The overall impact of this move will have to be studied far into the future, but for the state of Massachusetts it means a step in the direction of becoming a hub for major corporations in the future.